Published on Thursday, January 21, 2016. Marvin Lipofsky in one of many postcards he mailed to the ACC. 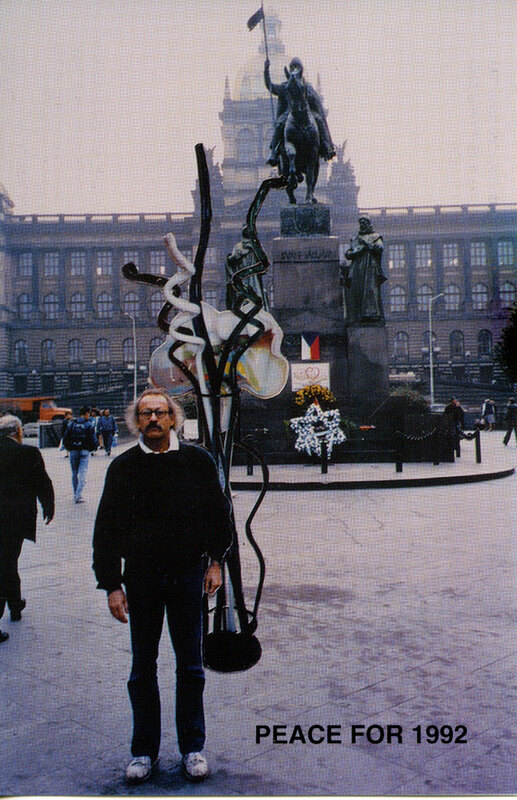 Lipofsky's work Flowers for a new Czechoslovakia... (1991) is superimposed next to the artist. It is with great sadness that we share the news of the death of glass artist and educator Marvin Lipofsky on January 15, 2016. A Fellow of the American Craft Council since 1992, Lipofsky was a pioneer of the American studio glass movement and a beloved teacher to students around the world. He was 77 years old. Born in 1938 and raised in Barrington, Illinois, Lipofsky earned his BFA in industrial design in 1962 from the University of Illinois in Champaign-Urbana. He went on to earn an MS and an MFA in sculpture while studying under the renowned Harvey Littleton at the University of Wisoconsin-Madison. Following his graduation in 1964, Lipofsky was hired by the University of California-Berkeley, to lead the creation of the University's glass program. He left UC Berkeley in 1972 to develop the glass program and teach full-time at the California College of Arts and Crafts in Oakland. He retired in 1987 to focus on his own work in his Berkeley studio, where he proceed to work until his death. In addition to engaging students in the Bay Area, Lipofsky traveled throughout the United States and overseas, teaching more than 300 workshops and visiting more than 30 countries throughout his lifetime. During his travels, he collected raw materials, insight, and ideas from other makers that he would incorporate into his own colorful, abstract glass sculptures. The inspiration his travels gave him is evident in the postcards Lipofsky would send each year. They highlighted new works that were often named for the places he had recently visited (see photo above). 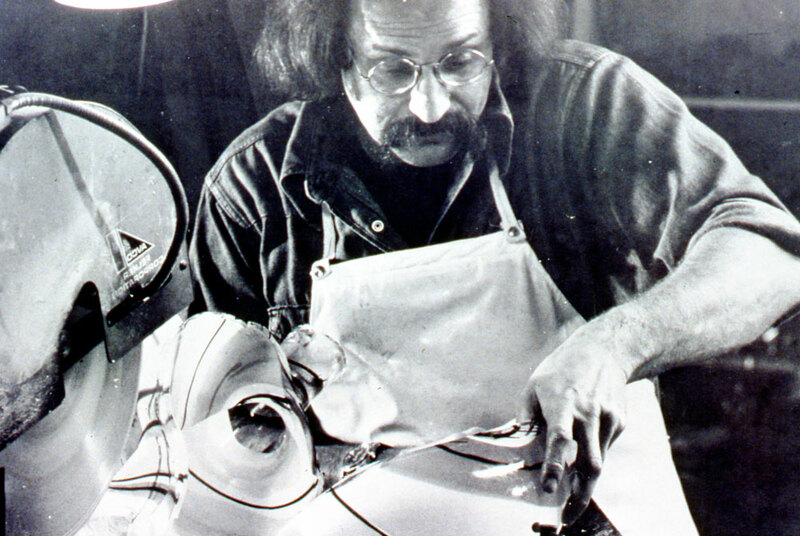 Lipofsky was a founding member of the Glass Art Society, serving as its president from 1978 - 80, and as the first editor of the Glass Art Society Journal from 1976 - 79. Throughout his career, he served on the boards of many organizations, including the American Craft Council, the National Council on Education for the Ceramic Arts, and the California College of the Arts. His works can be found in private and museum collections the world over, including the San Francisco Museum of Modern Art, the Metropolitan Museum of Art in New York, the National Museum of Modern Art in Kyoto, Japan, and the Museum Bellerive in Zurich, Switzerland - to name a few. In a feature article on Lipofsky from the October/November 1991 issue of American Craft, writer Cheryl White noted this about the influential artist: "His sculptures speak eloquently of the hot-forming process and the material's multifaceted capacity for beauty. But they speak just as definitively of Lipofsky's avocation as a kind of roving ambassador of glass." For more on the life of Marvin Lipofsky, please check out this oral history interview with the artist conducted by Paul Karlstrom for the Archives of American Art's Nanette L. Laitman Documentation Project for Craft and Decorative Arts in America.